Santo Tomás, Cider and a Sow! December 21st is a very special day for San Sebastian. For the last two centuries, on this day, the Donostiarras* get together to visit the Santo Tomás Market; the baserritarras* are the main focus, who come down from the nearby towns to the Plaza Constitución (Constitution Square) to sell and display their local products and animals. Last year we came with a Japanese group. We wanted to give them a surprise by taking them directly to the heart of the party, first thing in the morning, right before it was crowded. In the arches of the square, a former bullring, students from different schools set up their stalls of fried txistorra* with talo*; they had portable cooking stoves and tons of bottles with the first cider of the season. Traditionally the students use the money they collect to fund their High School Senior class trip. 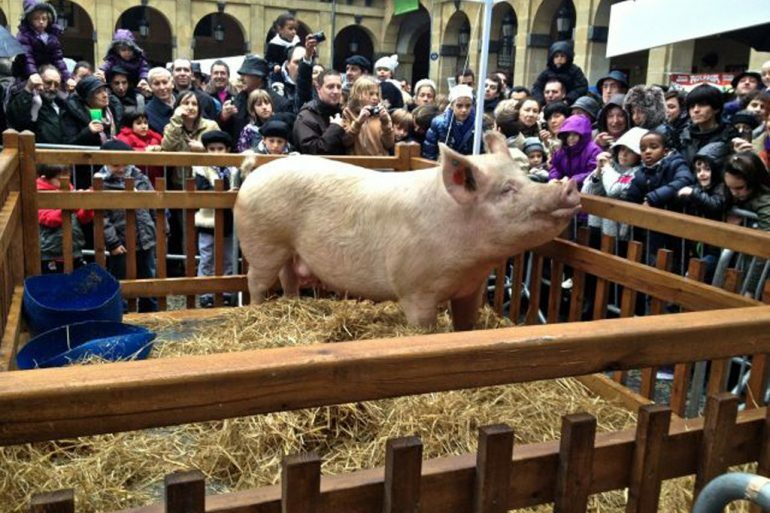 Soon after we arrived, people started coming dressed in local costumes ready win the 300 kg sow raffle. Laughter and heartfelt toasts filled the air. Some groups of friends begun to sing. Just 40 minutes later, one of our guests managed to join the locals and wore a typical handkerchief around his neck; a gift he received as a welcoming gesture. When we went out to visit the pintos bars that surround the square, they found hard to believe that all the bars were giving away free delicious txistorra to commemorate this day. The day before yesterday we received an e-mail from one of them: “Just a couple of days left to enjoy the celebration of Santo Tomás! Have fun for me!” – We’ll do Mari!! And we will miss you! !